Just got a new smartphone? Congratulations, it's already obsolete. 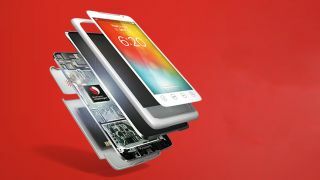 Qualcomm has just unveiled its newest chipsets which should hit phones in early 2015. There are two chips to get to grips with. The Qualcomm 810 can handle cameras with up to 55MP image sensors, 4K video and Ultra HD displays, high-speed LPDDR4 memory and offers beefed up Wi-Fi, Bluetooth 4.1 and NFC connectivity. The chip's Adreno 430 GPU is 30% faster than its predecessor which is nice to know since there aren't even any phones out yet with the already out-dated Adreno 420 GPU in them. You can expect to see the octa-core 810 start to show up in the very high end phones and tablets at some point next year with Ultra HD screens on board. Only slightly lower down the scale is the six-core Snapdragon 808 with its 2K display support and speedy Adreno 418 GPU for WQXGA displays. That means next year's mid-to-high-range smartphones could well be rocking 2560x1600 screens. The 808 is also down with 4K out-put via HDMI and LPDDR3 memory and the improved Wi-Fi connections. Both are 64-bit chipsets and Qualcomm says they should be smaller, lighter and offer better battery life than their forefathers. Speaking of future phones, how about that iPhone 6 then?